You should have already successfully installed the Arduino environment on your laptop, built the LED circuit, and successfully load/run the “blink” program to make the LED blink. Congratulations! In exploring these features, we will use Arduino to not just blink a single LED, but to control and fade several LEDs at once. 1. Start with the LED circuit you built for the “Blinking LED” Assignment. For that assignment, we used pin 13 to control the LED and make it blink. Ardiuno has several pins marked PWM which support Pulse Width Modulation. 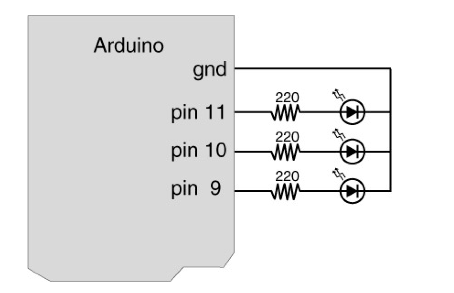 The example code uses Pin 9, so simply move the controlling wire from Pin 13 to Pin 9. 2. Load the example code from the Arduino Sketchbook (File‐>Examples‐>Analog‐>Fading). Load this onto the Arduino and watch the LED Fade. 3. Extend your circuit so that it includes 3 LEDs according to the diagrams below. Notice Pins 9, 10, and 11 are all marked PWM. 4. The following code dims the 3 LEDs according to a pattern. For your convenience, a copy of the code can be downloaded here (DimmingLEDs.txt). Look at the code and make sure you know what each line does. 5. Up until now, the Arduino board has been operating on autopilot once you’ve uploaded the program. In this step, you will be using Arduino’s Serial Communication feature. The code is provided here (serial_led_rgb.txt) and is available on the course webpage. Look at the code and make sure you know what each line does. (Optional) Come up with other ways of controlling the colors of the LEDs using the keyboardHere’s your chance to be creative. You can show off to your friends next week. Example: Read colors and set the appropriate RGB values like “orange” might set r=70%, g=50%, and b=0%.